This is an excellent pattern to use in the summer. Fish across the wind and allow the lure to float, imitating a stunned fry. Harry Stewart started fishing when he was about seven years old and as his home was then on the River Gryffe in Scotland, he knew every nook and cranny in this river. He says he cannot remember being taught to fish or tie flies. At the age of 14 to 15 he had progressed from trout flies to Salmon flies that he sold to Alex Martin Ltd in Glasgow for pocket money. Although they supplied the materials he still did not have a vice! Tail : Peacock herl 4 to 5. Under Body : Plastagote, epoxed to hook. Body : Pearl mylar tube. Back : Peacock herl 4 to 5. 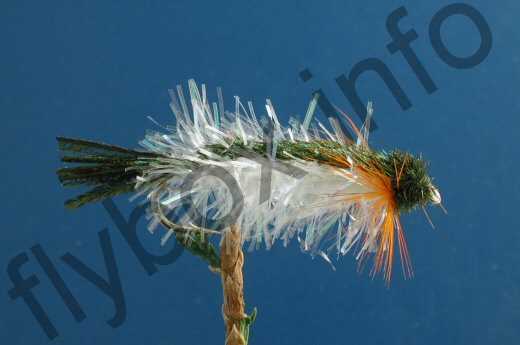 Beard Hackle : Orange hackle fibres. Currently there are no comments about the Stewart's Floating Fry fly pattern from other fly fishermen yet.